Simple Administration — Intuitive, task oriented interface allows already overworked administrators to perform common actions with minimal effort. Administrative responsibilities may be delegated to a domain administrator. End users are empowered to determine the fate of a message without the need to contact the administrator. Comprehensive Reporting — Identify email traffic patterns and potential problems with SecurityGateway for Exchange/SMTP's comprehensive reporting. All reports support point-and-click drill-down targeting allowing further analysis to be performed. Accurate Detection — With multiple analysis tools for separating threats from legitimate email, SecurityGateway for Exchange/SMTP leverages the best proven anti-spam, anti-virus, anti-phishing, and anti-spoofing technologies to produce a 99% spam blocking rate and achieve nearly zero false-positive results. Data Loss Prevention — In addition to inbound mail traffic filtering, SecurityGateway for Exchange/SMTP also filters outbound email. An easy-to-use interface allows policies to be created which detect and prevent the unauthorized transmission of sensitive information outside of your network. 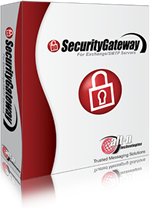 Powerful Filtering Engine — SecurityGateway for Exchange/SMTP's powerful filtering engine is based upon the industry standard SIEVE mail filtering language. An administrator may extend its functionality by using their own SIEVE scripts. Defense Layer Customization™ — A unique control method that allows email administrators the flexibility to prioritize the order of operations a specific security rule will execute when analyzing incoming or outgoing email traffic.